The goal of the MOVIA research network is to foster the development of seamless navigation solutions. 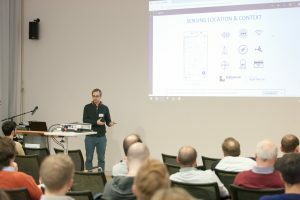 This talk gives an introduction about the status quo of smartphone localization and tracking methods and their application scenarios in indoor and outdoor environments. A concept for an interoperable and unified localization platform will be presented to solve existing fragmentation problems.